The 41.14 metre motor yacht Polly, listed for sale by Mark Elliott at IYC, has been sold with Wes Sanford at Northrop & Johnson introducing the buyer. Custom built by New Zealand superyacht yard Alloy Yachts to Lloyd's class, Polly was designed by Dubois Naval Architects and delivered in 2007, formerly named Como. Complementing her metallic silver superstructure are long black glass windows that stretch uninterrupted along the sides of the main deck, contrasting with her striking blue hull. Redman Whiteley Dixon are responsible for her light and sophisticated interior with cream silk carpets providing a soft contrast to the marble surfaces and mahogany panelling. The open plan saloon has large windows for endless views, marble flooring, a wet bar and comfortable seating on a large L-shaped sofa along with two occasional chairs. Forward is a formal dining space with seating for 10 guests. MCA compliant, her accommodation is for up to 11 guests in a five-cabin layout consisting of a full beam master suite on the main deck, while below there are two doubles with queen size beds and two twins, one with a Pullman berth. All cabins come with entertainment systems and marble en suite bathroom facilities. Al fresco entertainment is in plentiful supply on the spacious upper deck, with a custom hard top, a bar, fridge and six-burner barbecue along with loungers and a dining area forward for 12 guests. More outdoor space is available on the comfortable bow sun pads or the expansive shaded aft deck. Powered by twin Caterpillar C30 1,550hp diesel engines, she has a transoceanic range of 4,500 nautical miles and a top speed of 18 knots. 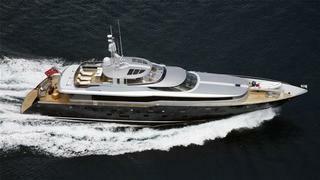 Lying in Freeport, Bahamas, Polly was asking $10.9 million.